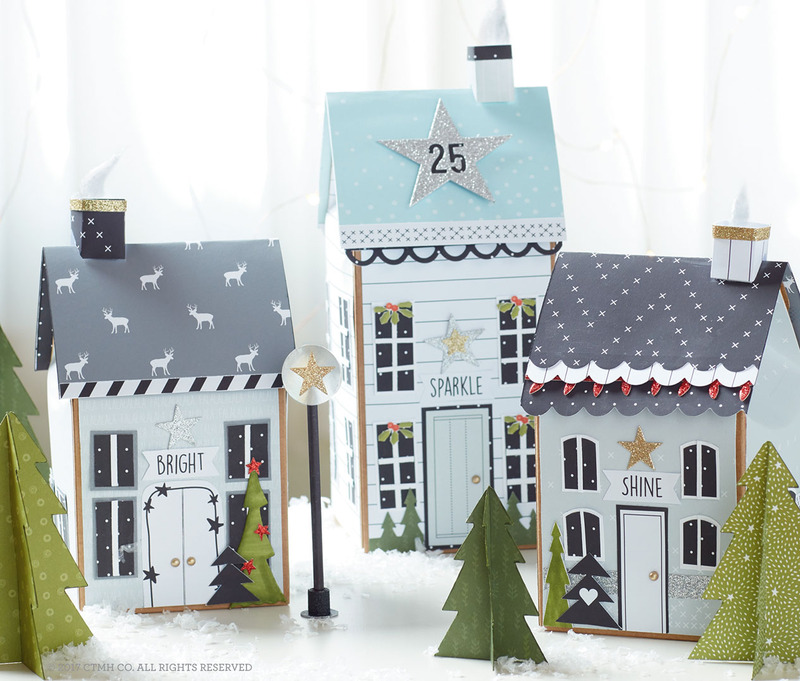 The winter village on the cover of our Holiday Expressions idea book has been getting a lot of attention, SO we are breaking it down on the blog today for you to make one of your very own! When we assembled our village, these were readily available at one of our local craft stores, but we’ve found some similar options available online that you can use to get the same look (see the recipes’ below for the links). Now, let’s take a look at how we transformed these boxes into festive holiday decorations! There you have it—our secrets to creating a paper winter wonderland! Please ask questions or share any tips of your own in the comments below! Thanks for these fabulous recipes! So many CTMH designs are beautiful, yet WAY beyond my simple capabilities without a detailed roadmap. These are great! Where are the links for the online sources for the craft boxes? Thank you! Each of the items in the recipes are hyperlinked to where they are available for purchase. Love these and so want to make the, but cannot find the links to the boxes in the article as promised. Perhaps I missed them? Odd when I first read this, links were not coming up….but now they are there…ignore my previous comment. Sorry for the confusion! The hyperlinks were added just a few minutes after the post went live. It would be really nice if you could provide instructions on all the examples in our catalog. One of your very own consultants has already done a set of instructions Who are these little houses as well as a huge set of cards using the silver and gold collection and it’s simply amazing. Her fellow consultants have been clamoring to get a copy of the instructions. she took her time to do it right and when she got it right a good portion of the proceeds we’re going to go to operation smile. Were the windows Cricut cuts? And the chimney trims are gold shimmer trim? CUTE little village!!! And, such great details in each tiny house! Thank you SO MUCH!!! I have been looking for the instructions to make this since e the catalogue came out!!! oh please! how could i buy it if i leave in France? you have so beautiful papers and i m such a huge fan of your creations!!! So glad you like it! Unfortunately we do not have a market in France just yet (one day!). Keep following us for continued inspiration. This is the cutest Christmas village !! Would you ever consider sharing your Design Space files if you are using Design Space?